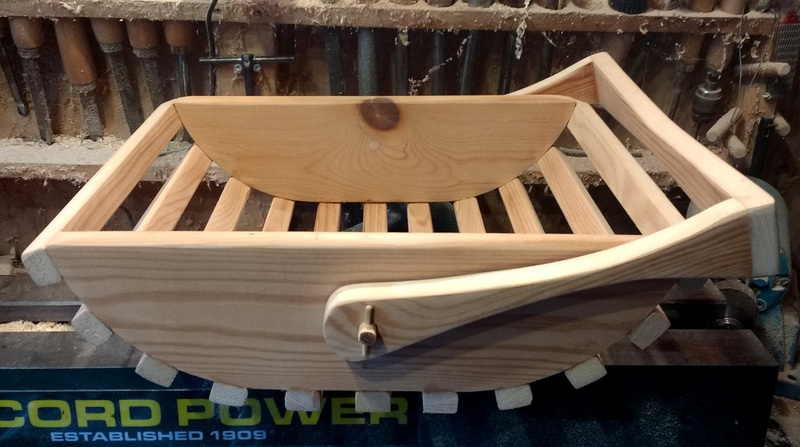 It's been a while since a made my last trug (about 6 years I think) and as I had some wood from an old shelf unit I though it was about time I made another, this time I've made one with a fold-able handle. Doesn't scream trug does it? As I said this is an old unit, which up until recently was in my daughters bedroom holding her ever expanding book collection, she now has an antique oak bookcase which I recently restored so this old slot together unit was surplus to requirements, I was just going to lay it on it's side and line it with plastic to use as a planter, but as we're changing the garden around this wasn't very practical. 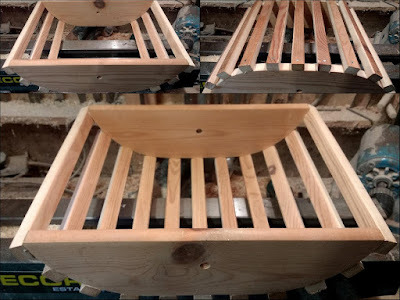 There's quite a bit of wood here, but I felt like a trug was in order, and because all the bits of wood have notches cut out I was wondering what else I could do with it, there are loads of things I could make, but I like making trugs. 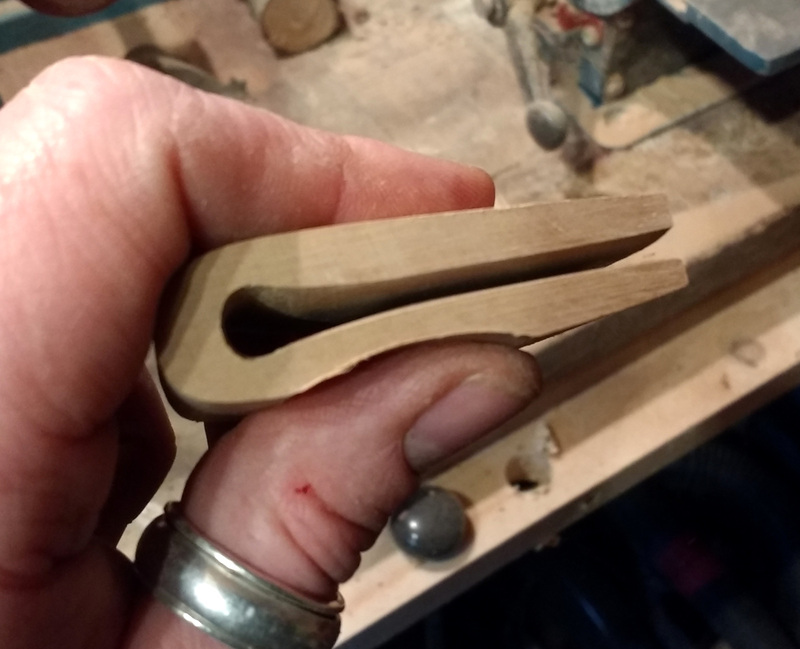 Firstly I cut two pieces of wood with a curved side, these make up the sides of the trug, then the idea is to nail slats between these two pieces to make up the basket part of the trug. 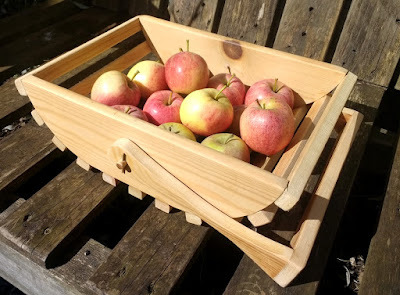 Should make for a good trug. So with the sides done it was time for the slats, these I cut using my bandsaw, but a table saw or even a hand saw will do just as well. I'll tidy these up later. Each slat is about 20mm thick (3/4 of an inch) and 25.5cm (10 inches) long the length of the slats gave me the width of the trug, so it ended up being 25.5cm (10 inches) wide and about 35.5cm (14 inches) long and about 9cm (3 and 1/2 inches) deep, so it's not huge but will hold a fair amount of stuff. 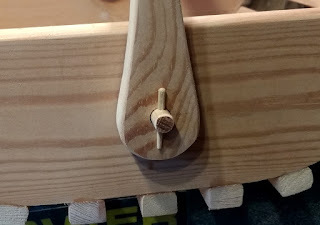 The gap between each slat is roughly 20cm (3/4 of an inch) so it has gaps, but it's okay for apples or spuds and other things, and it's easy enough to put a bag or cloth liner in it for smaller items. 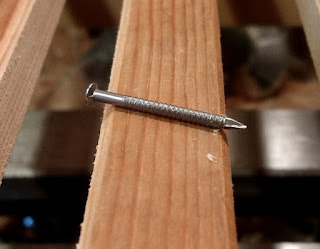 I used a good quality wood glue and annular nails to fix the slats, it's a good idea to drill small pilot holes for the nails to prevent splitting, just use a drill bit that's thinner than the nail. 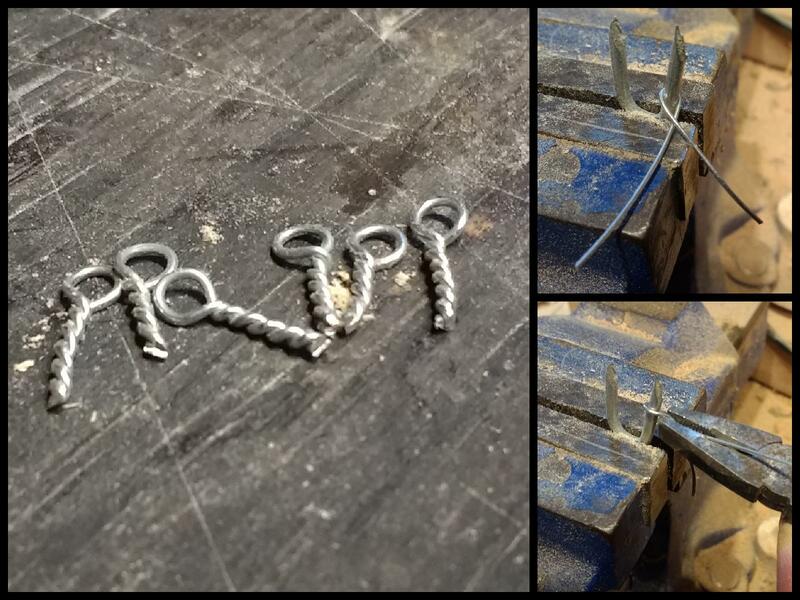 Annular nails have what looks almost like a thread running along part of them, this helps the wood fibres to bind to the nail and helps prevent the nails being pulled out, if you've ever taken a pallet apart you'll have no doubt come across this type of nail. You can see what looks almost like a thread. 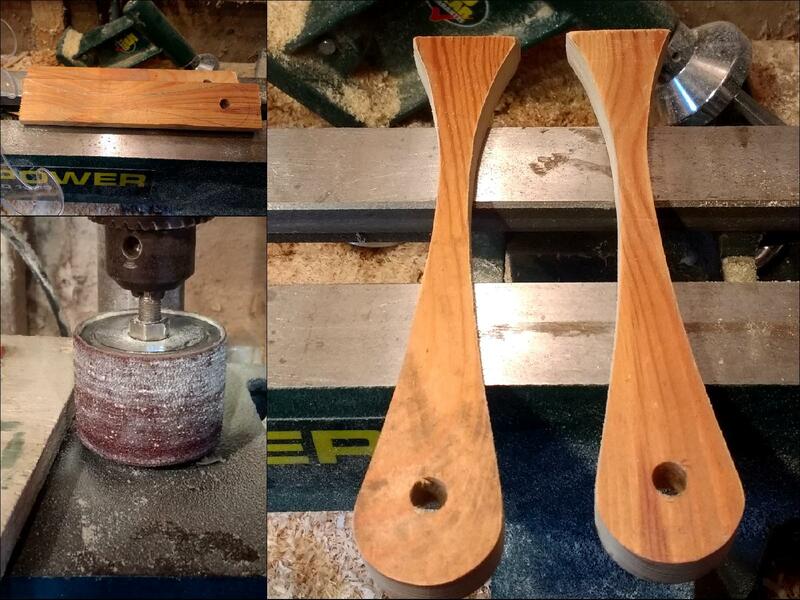 With that done it was on to the handle, this is made in three parts, two sides and a top piece. 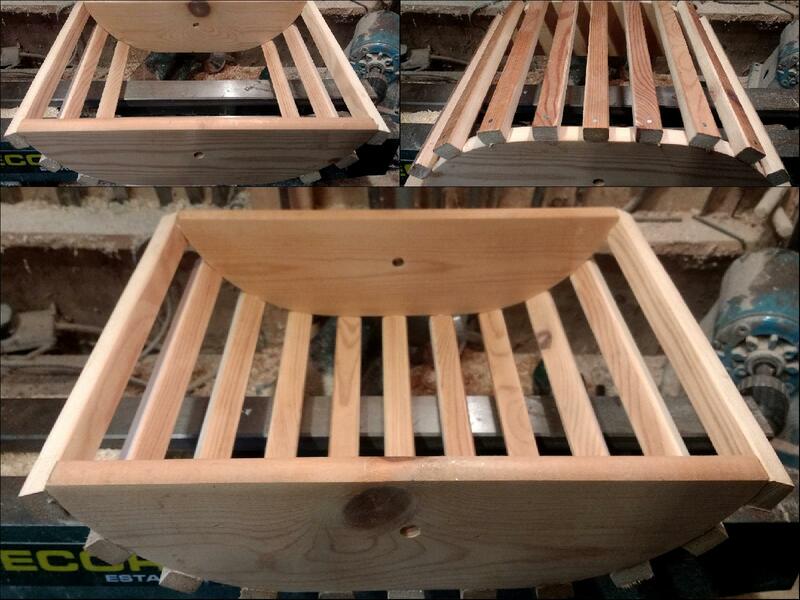 The two sides are held to the main body of the trug using a wooden peg, this is what also allows the handle to fold. 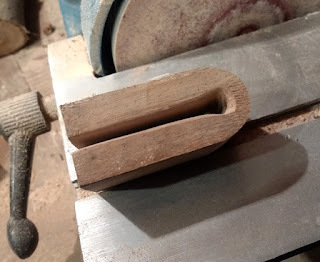 To make the handle I drilled out the hole for the peg in two bits of wood, and then set about drawing a shape onto each bit of wood, then I cut out the shape on the two bits of wood, I ended up with a kind of fish shape. I did say kind of fish shaped. The top piece of the handle is fixed to the side pieces using a couple of screws and glue on each end. 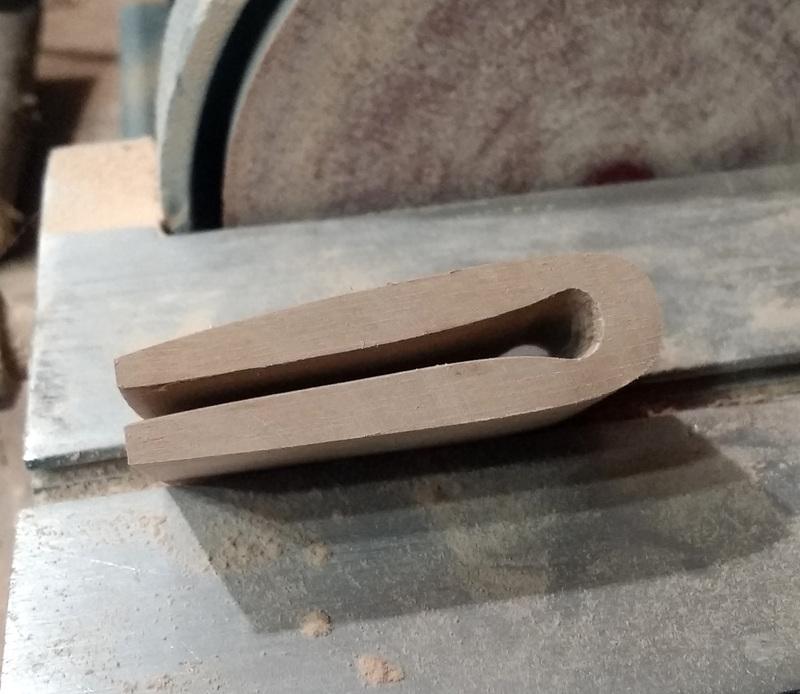 Rather than have just a flat handle I've cut it into a bow shape to fit the hand better. It feels better in the hand, rather than just a flat bar. To fix the handle to the body of the trug I've used two pieces of 9mm dowel, the dowel is glued into the body of the trug and the handle is held onto the pegs using a small pin, this gives the trug a more rustic look, well I think it does. 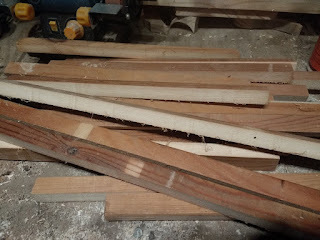 You can make out the wooden dowel. The pin is easy to tap out if the handle breaks. 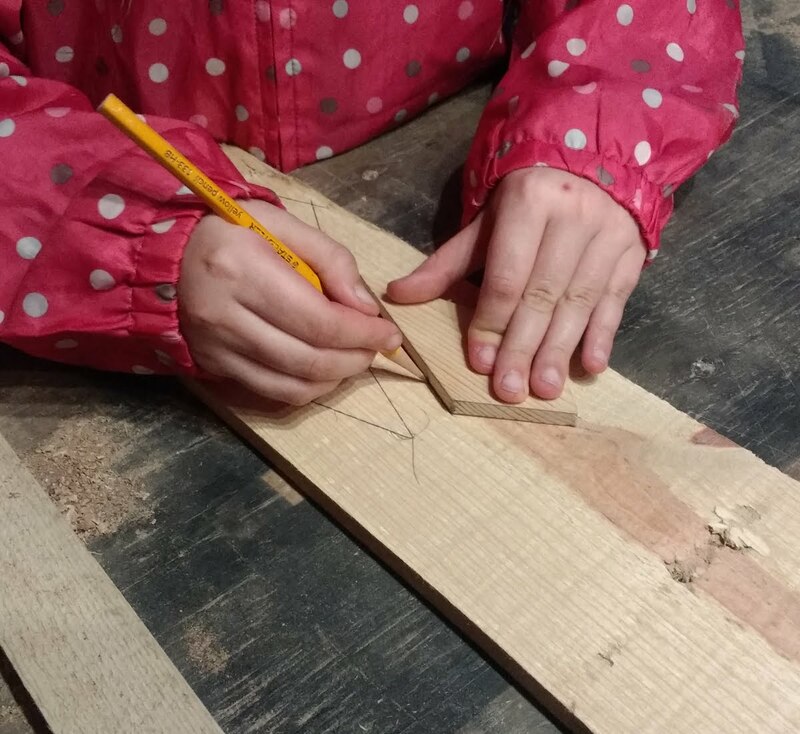 That's about it, it's a really simple thing to make, it uses very little wood, I've still got enough to make a few more like this left over, it's something that would make a good project for kids to try, you don't need loads of power tools, it can be made totally by hand and in numerous different designs and it's practical as well, even if you don't use it for collecting apples it would make a great fruit bowl for a kitchen table. At present we have numerous tubs around the house, tubs with wine at various stages, we also have a load of demi johns full of wine as well, and today I decided that some of that wine was ready for bottling, the problem is it was about 20 litres of wine or more, which is a lot of bottles that needed to be sterilised and dried. Usually I put the bottles into some of the empty brewing tubs we have, but as they were all full I decided on a different method, that being filling the bath (after a good clean) with hot water and sterilising powder and chucking the bottles in. 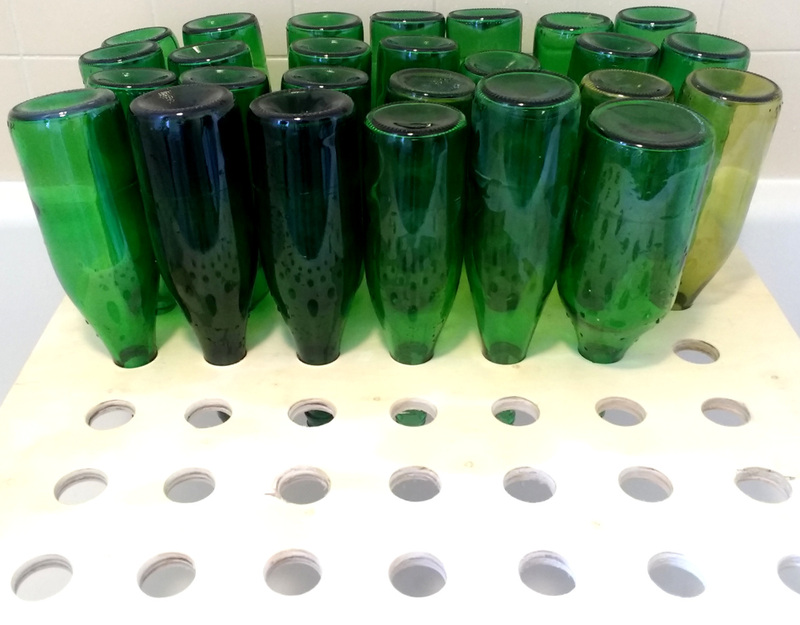 This works well, but drying the bottles can be a pain as you need to let them drain and it's not always practical to stand them upside down on a draining board or other surface as they have a tendency to fall over so I made a very simple drying rack. Not a lot to it really. 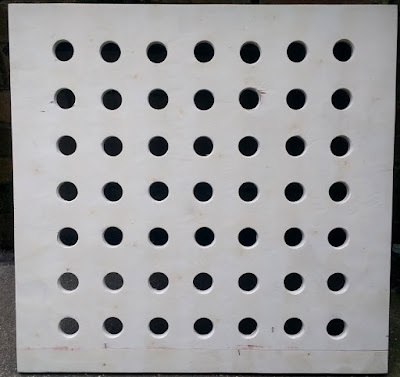 At this point you might be thinking it looks like a sheet of plywood with some holes drilled in it, and you'd be right because that's exactly what it is. 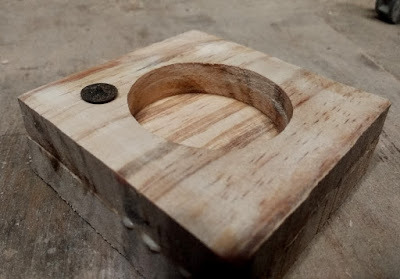 Basically what I've done is take a sheet of plywood and drilled holes in it, holes big enough to fit the neck of a wine bottle in so you can stand it upside down over a bath. 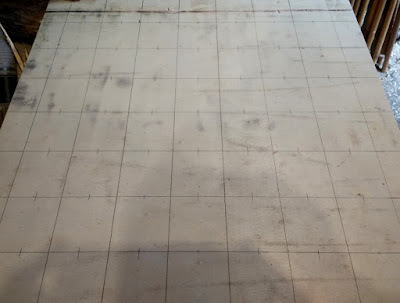 To make it I first measured the width of the bath, which as it turns out is about 660mm (about 26 inches in old money) so using that measurement I made it 660mm wide and the same in length, so I ended up with a square 660mm wide by 660mm long. I measured in 50mm (about 2 inches) on two sides to allow for the sides of the bath. Then I marked out a grid so that I knew where to drill the holes for the bottle necks, to mark up the grid I took two measurements from the wine bottles we have, the diameter of the neck and the diameter of the base, this as it turned out was about 32mm for the neck and about 80mm for the base. 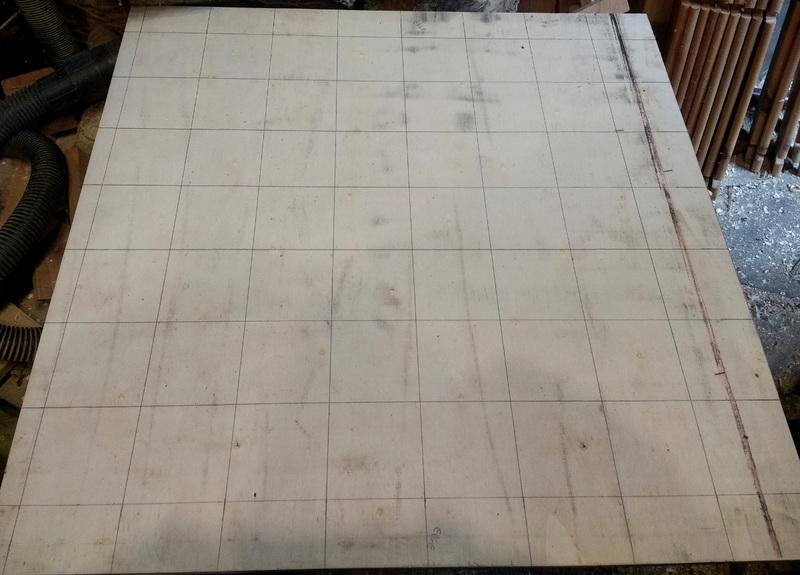 Measuring in from the marks I'd made to allow for the bath sides I made a mark at 80mm intervals until I reached the end of the wood, then I did the same the other way which gave me a grid of 80mm squares. Now to work out where to drill. 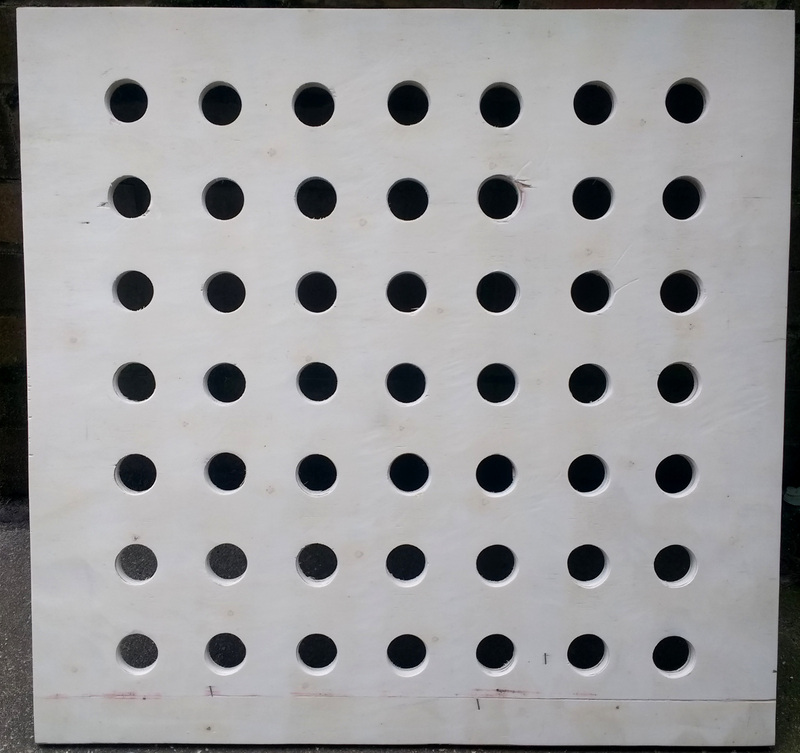 To mark the drill holes I put marks at 40mm on each line, this gave me a total of 49 holes to drill. 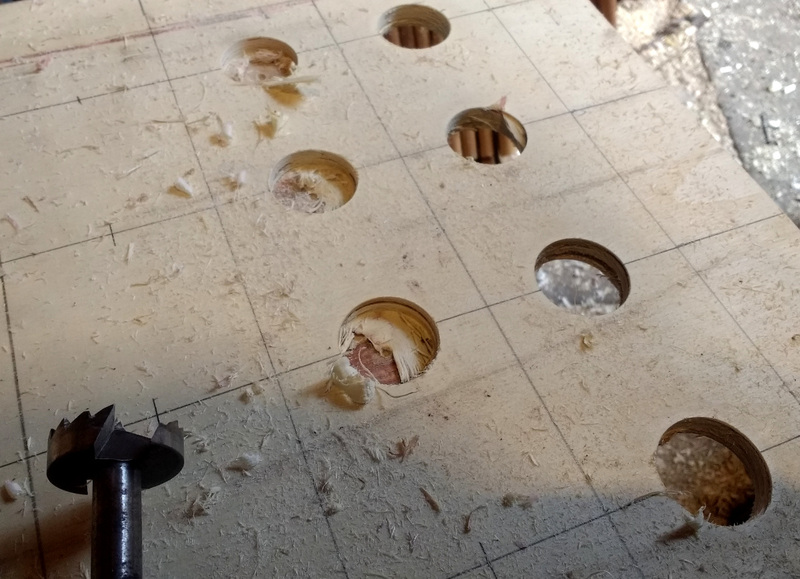 Then using a 35mm forstner bit I set about drilling 49 holes, these holes are where each bottle will sit while the rack sits on the bath, think of it as being like one of those over the bath racks everyone used to have, the wire things that had soap and sponges and all manner of other stuff, I bet your nan had one. And that was about it, I gave the hole thing a sand and it was done, and I have to say it works well, and it saves me having to take up loads of space in the kitchen and the bottles are much more secure now, I may give it a coat of something to protect the wood a bit, and I may add some extra support at some stage, but all in all it was a cheap solution to a problem. Works like a charm, and as it's flat it will be easy to store away, shortly after this picture was taken these 26 bottles were filled with wine made from grapes we grew on our allotment plot last year. These types of boxes aren't a new thing, but they are easy to make if you don't have a lot of time, I didn't take pictures of the heart shaped one as I made it, so I made a couple more quickly to demonstrate the method, which have since disappeared into the depths of my daughters bedroom. It is what it is, a plank of wood. I cut it into three pieces roughly 7cm square, top, middle and bottom, I cut a hole in the middle piece with a forstner bit, but you could use a hole saw or spade bit, there are numerous ways to make holes in wood. 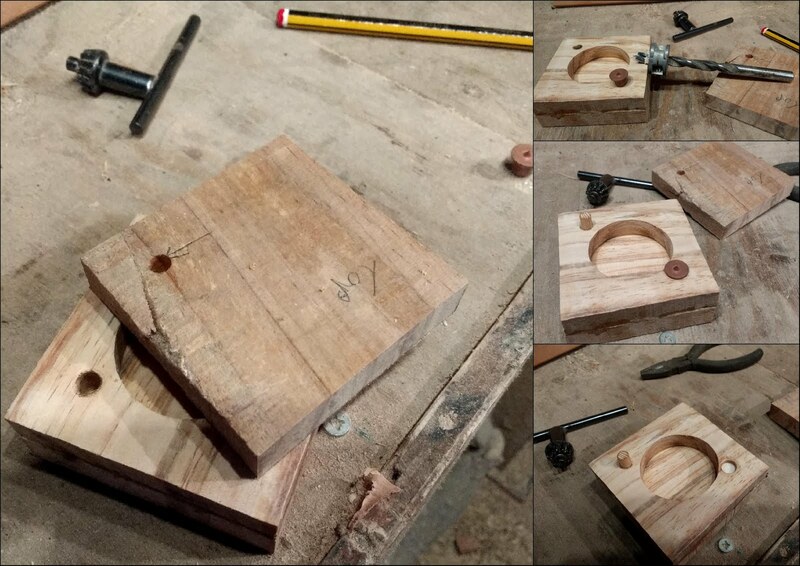 Once I'd made a hole in the middle piece (this makes up the void where things will be stored) I glued the middle piece to the bottom piece with wood glue and used some clamps to hold it in place. 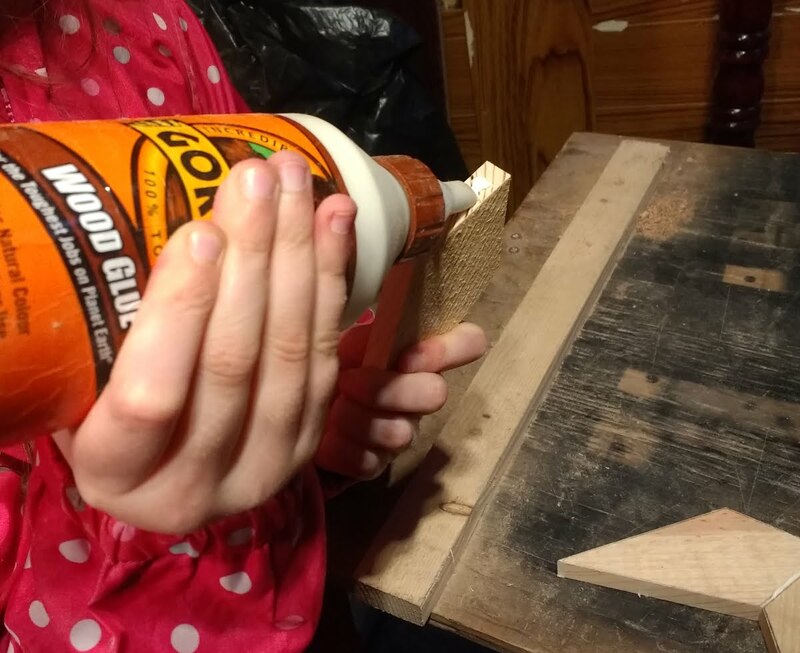 Once the glue had set it was on to the next step. 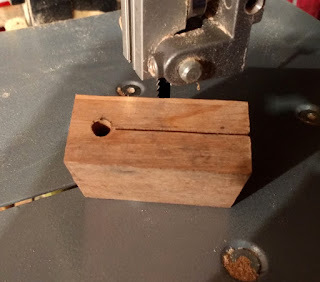 Basically these are small metal inserts that have a point on one end, the idea being you drill a hole in the wood (using a drill bit with a depth guide) place the insert in the hole and the use the point to mark where the other holes should be drilled, and in theory when you drill out the holes they will all line up and your dowels will be nice and straight. 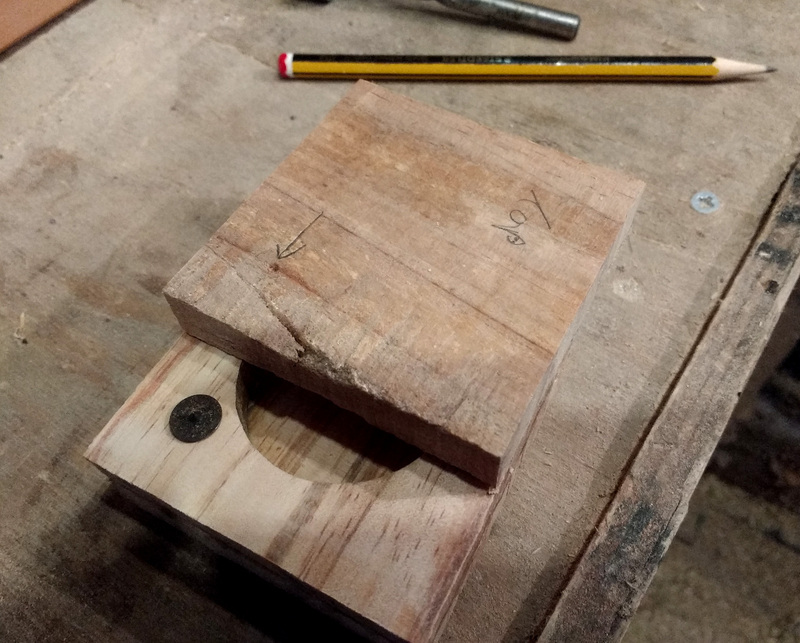 If you have access to a post drill or one of the guides that you can mount a drill in it's best to use it, the straighter the better for this as you want your holes to be as straight as is possible, you can also make a guide block from two bits of wood in an 'L' shape. And with that done you then press the other bit of wood down on top of it to mark the next drilling point, and that's it, it's worth taking your time to make sure things are all nicely lined up and I've found that making the swivel point before the final sanding and shaping is better because if things are slightly off you can then shape and sand any miss-alignments out. You can just make out the marks in the picture. 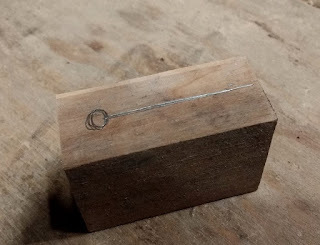 And that's about it, once you have holes in both pieces of wood you can put a pin in, I used a piece of dowel, but you could use metal or plastic, the length of the pin will be determined by the depth of each hole in the respective pieces of your box. 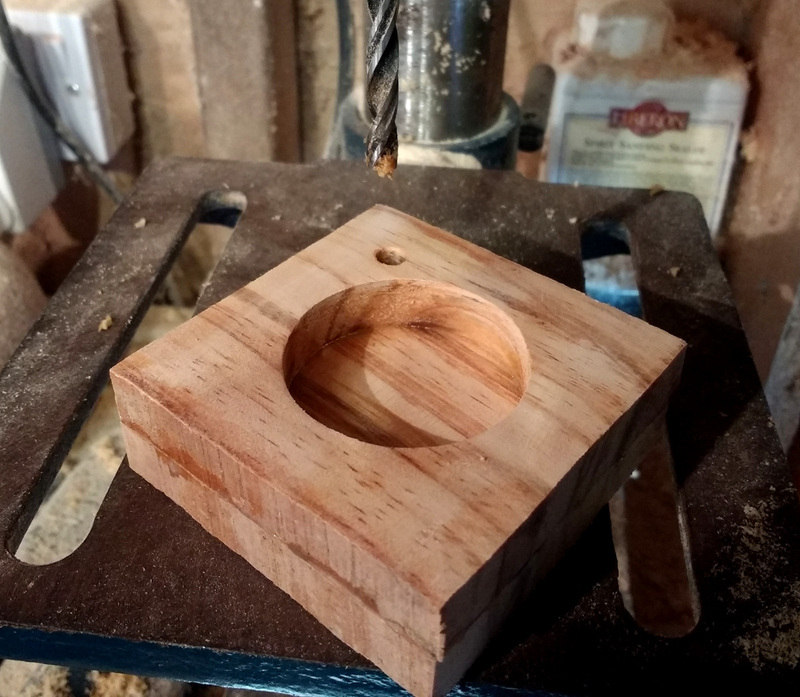 I decided to go a step further with this particular box, I've added a couple of small magnets to help keep the box closed, and I've used the same method as I did with the swivel part, that being using dowel setting tools to mark out a couple of shallow 8mm holes in the base of the box and the lid, which are a perfect fit for the 8mm neodymium magnets I have. Basically the same, just a larger hole. 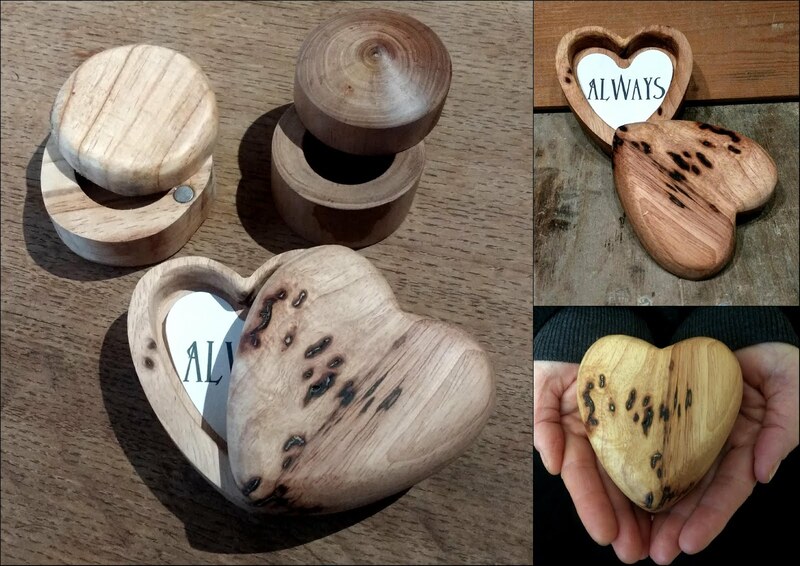 Once that was done I roughly shaped the box with a sander, I also made a small round box on my lathe with a swivel lid in exactly the same way, I turned the two halves of the box and using the dowel setting tools made a swivel point on it, obviously if you want to make a shaped box, be it heart shaped or whatever floats your boat then cut each piece into roughly the right shape and once you've got everything lined up then do the final finishing. There's no reason you can't make the boxes deeper by adding more sections, or why not take a log and using a hole making bit (forstner or spade) hollow it out for a rustic looking log box, you can buy small metal (brass etc) catches which are easily attached with small pins or glue, planning on getting engaged ? why not make a small wooden swivel ring box ? just a thought. Now I know that it's pretty much the end of January, but hang in there. 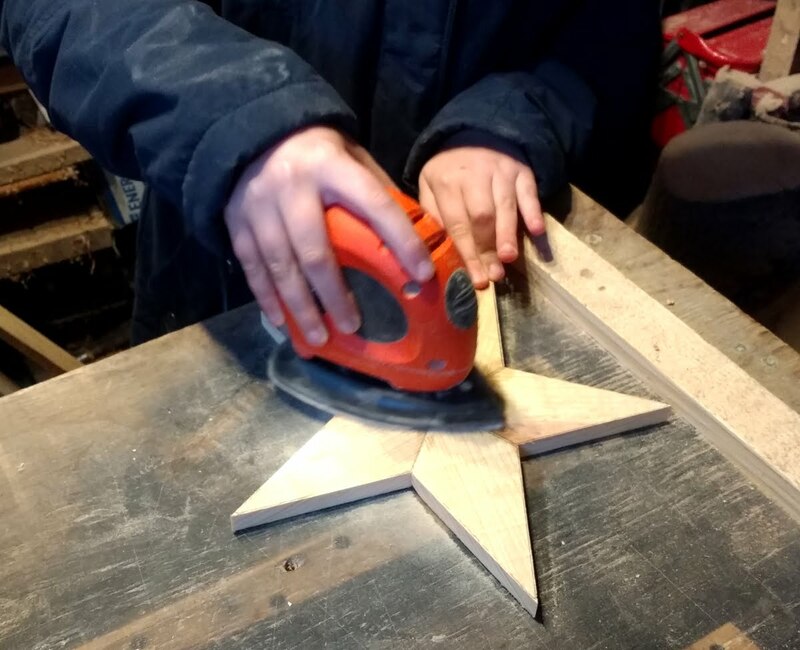 I did mean to write about last years Christmas decorations, but as you know time marches on and before you know it the moments passed. 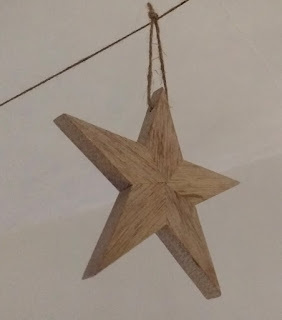 For years we've been making our own decorations, and not just for Christmas but for various other times of year (like Halloween) and I decided I'd make something for the tree and it's something I've been meaning to make for a while. 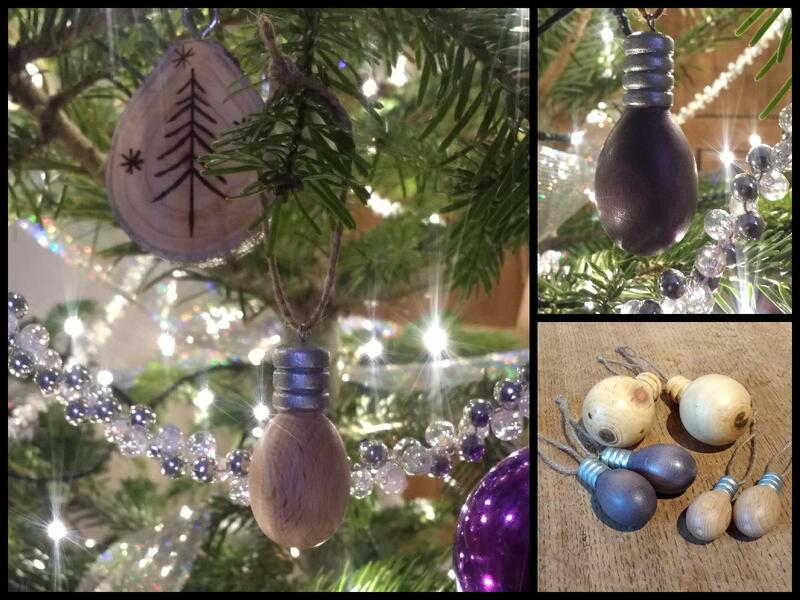 Yes I made wooden light bulb style ornaments for the tree, which I'm pleased with, I think they worked well and they are a good addition to our decoration collection. I did try to make them from a bit of scrap Pine at first, but I wasn't happy with the end results, so I recycled a bit of Beech from an old table leg, so not only do these look good on a tree, they were free, all it cost really was a bit of time. 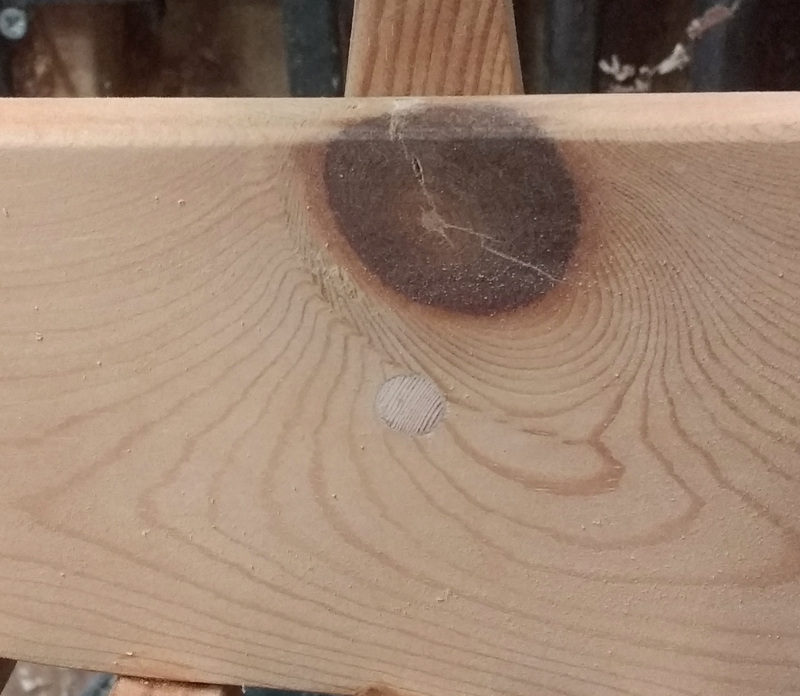 As I said the Pine didn't work well as I couldn't get a finish I was happy with, especially when I applied the wood dye, but the Beech worked a lot better. Not much to say really, it's an old table leg. Not quite identical, but close enough. The dye I mixed myself, I have a number of purpose bought wood dyes, but not in purple which is one of the colours we use on the tree every year, not loads of it, just little bits of purple here and there. 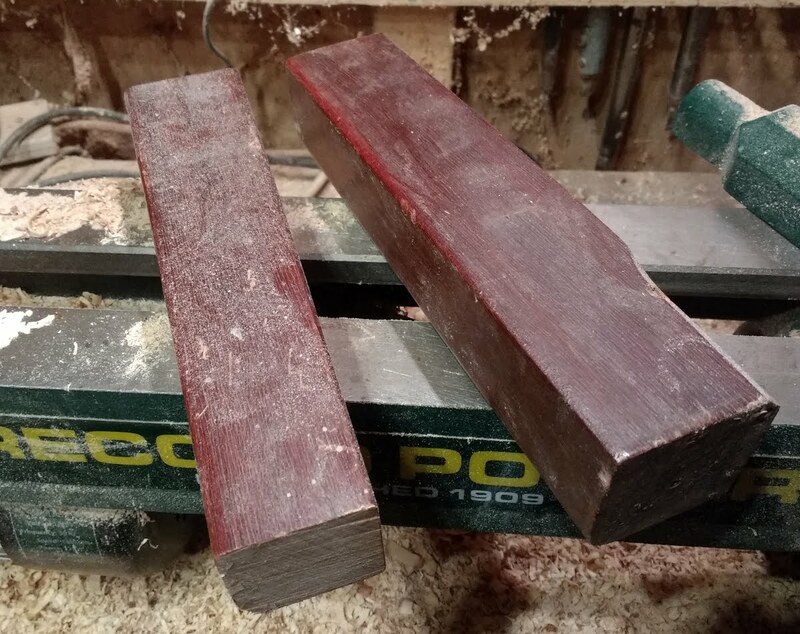 To make the purple I simply mixed a bit of blue and red wood dye together (blue and red make purple if you didn't know that already) I did have to tweak it slightly until I was happy with the colour, but I think it worked, and the grain still shows through the dye, which I wanted. 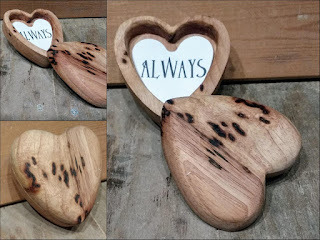 I have also in the passed experimented with printer inks for dying wood, these also work well, and you can sometimes pick up cheap refill kits from places like poundland. 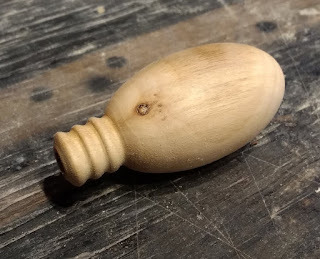 For the part of the bulb that's meant to look like the screw in part I used some silver paint, we have various pots of paint about the house, the one I used is cheap to buy, about £1.99 from our local diy shop and it dries quickly and is water based. 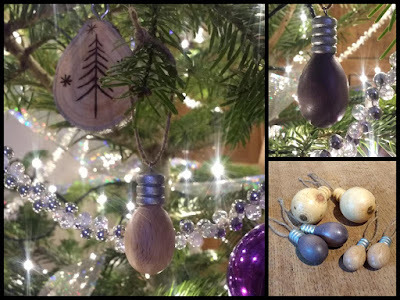 I made some little eyes for each bulb so that we could thread some natural string through them and hang them on the tree, I just used some silver garden wire for this. The eyes are just a bit of wire twisted round to form a loop, it's easy to do, just twist a bit of garden wire around something round, in my case it was a wire staple, which was the first thing I grabbed and clamped into my vice, but a nail would do just as well. 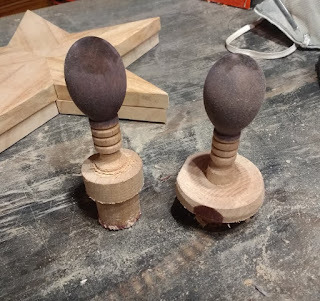 To fix the eyes into the bulbs I drilled small hole and twisted them in, they are very secure, but you could always add a little glue to make sure they don't pull out. And there you have it, I made six in all, unfortunately we couldn't hang two of the decorations on our tree because although they weren't huge they did weigh a fair bit (I made them from Laurel) and as we decided to get a real tree this year (one with roots, so we can use it again and again) it wasn't able to take the weight of them, maybe next year when it's a bit bigger. 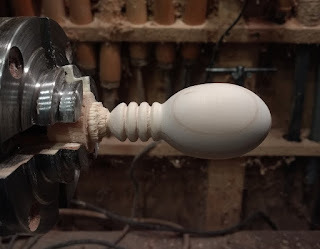 Obviously this is a project for a lathe, but if you know someone who has a lathe or maybe you're a member of a club that does wood working then perhaps you could have a go, or maybe this year will be the year you decide to learn how to turn wood and you'll get your own lathe? I have also made a light bulb shaped pull for the light cord in our bathroom, which I though was quite funny, because it turns on a light and it's light bulb shaped... ... but no one else thought so. Thanks for reading this very late or very early Christmas post. Last year we made some wooden stars with led lights in them, and as we try to make some kind of decoration for Christmas we decided to make some more stars using the same method. They survived the loft I'm pleased to report. We used the same method to make this years star decorations, only this time we've made a load of smaller stars so that we could make some garland type decorations, and my daughter also wanted to make a star to hang in her room, so a lot of the pictures in this post are of my daughter making her star, she made a few to decorate in different ways. 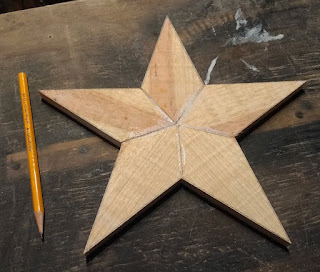 This really is a simple make, and even with out power tools it's really easy to do, my daughter is quite young and apart from me cutting the parts out with my bandsaw all of the other work was done by her, at least on the larger stars anyway, I made the fourteen smaller stars for the garlands. All the stars we made are made from pallet wood, so basically these were free to make. 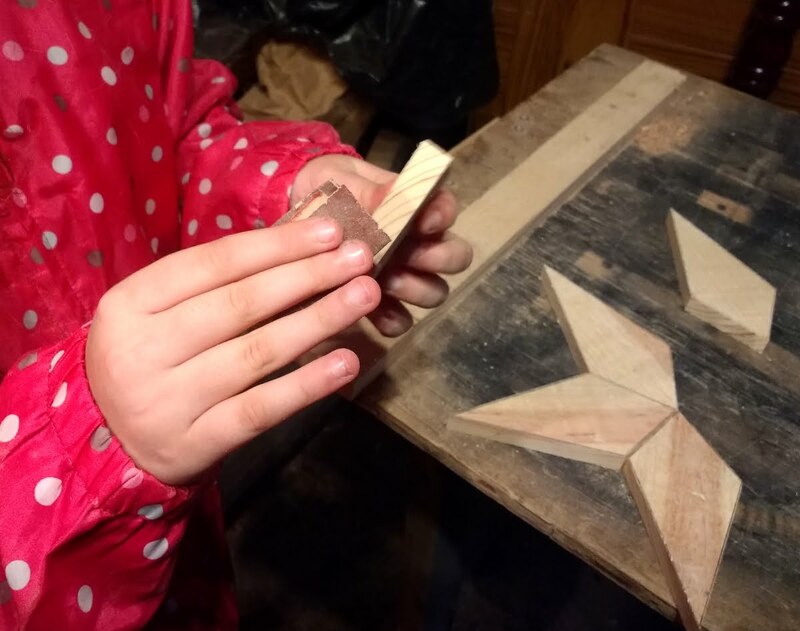 I cut out the segments roughly with my bandsaw, and my daughter then sanded each segment to the lines she'd made. 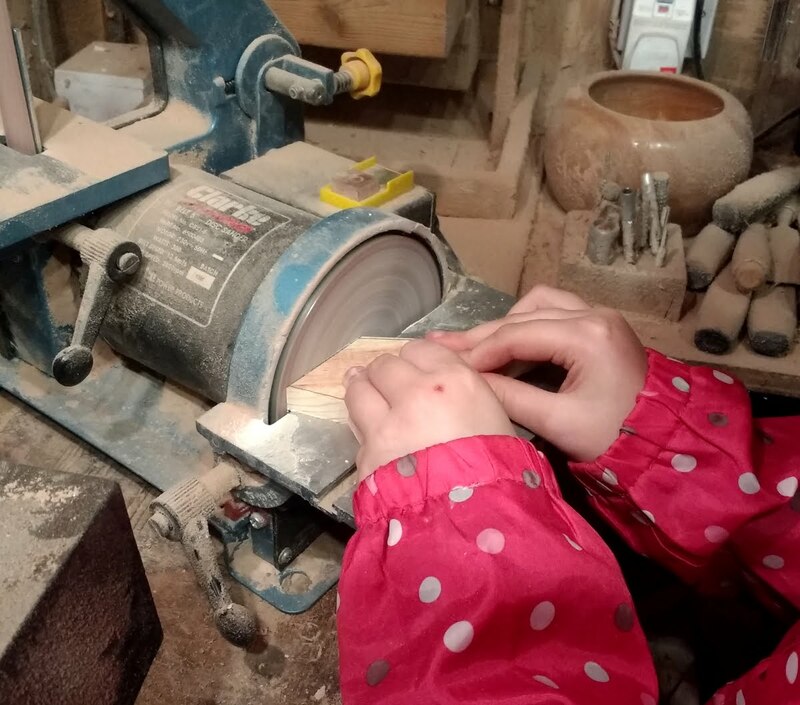 I made sure she wore a dust mask whilst sanding the stars, I also wore one and she also wore a set of goggles to stop dust going in her eyes. Good fit on each segment. 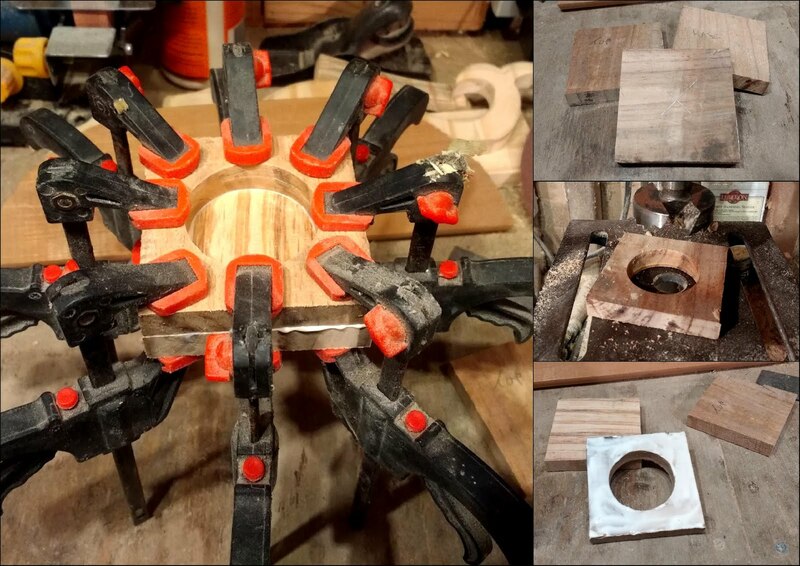 Nearly ready for some glue. I highly recommend gorilla wood glue. Once the glue was dry it was on to sanding the stars off so they could be decorated. She used the smallest sander I have, the larger ones are bit heavy she said, and quite noisy, but this little one works well. 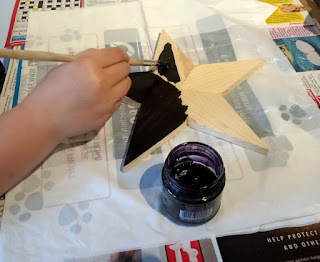 She decided that she'd stain one of the stars with a purple wood stain, this one now hangs above her bed, and the other ones will be decorated in something festive (probably involving glitter....shudders) the wood stain is water based and was mixed especially for the star and for another Christmas decoration project. It looks black, but it really is purple honest. Phone camera didn't really do the colour justice. Nice wood considering it used to be a pallet. 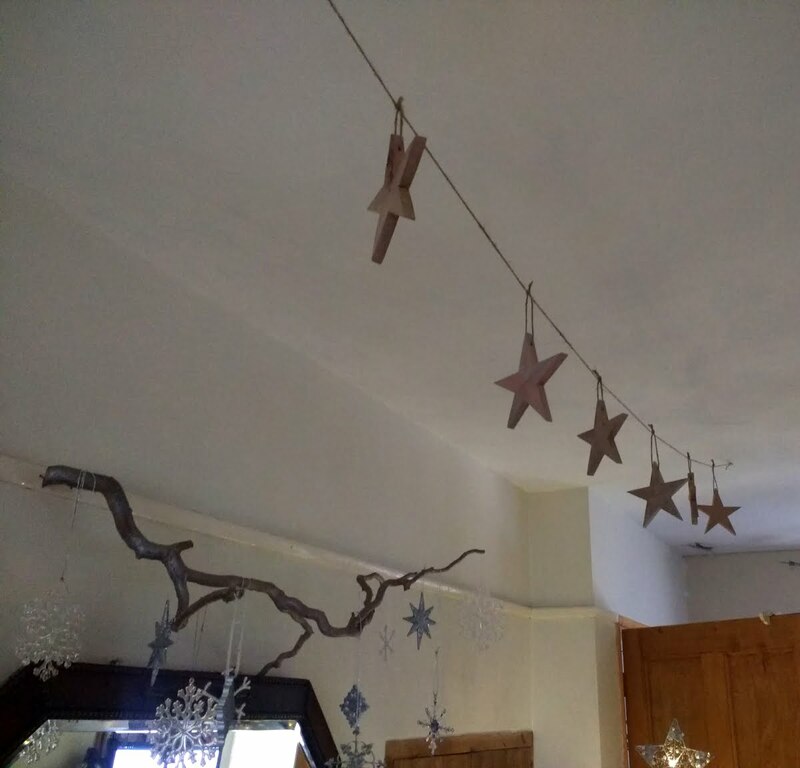 We (mainly me for this one) made a load of smaller stars to hang from the ceiling, they were made in the same way, just on a smaller scale and to hang them we drilled a small hole through one of the points and then threaded a bit of natural string through, this allows the stars to hang from another long length of string which we pinned to the ceiling. We made two garlands, each with seven stars, and in total each garland is about nine feet long, that allows for a gap of about a foot between each star with about a foot extra each end. It was difficult to get a good angle, but you get the idea. 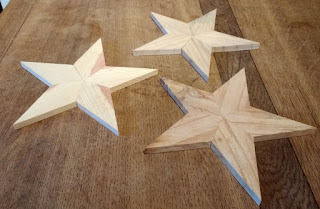 And that was it, not much too it, yes it was a little repetitive cutting out each star segment and then sanding and gluing, but it's worth it in the end as they look good, well we like them, and like the larger stars these were also made from pallet wood so cheap as chips. 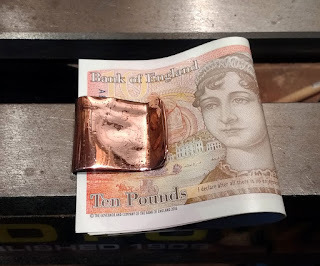 If you live in the UK you'll know that we've started changing our notes (money, 5's and 10's so far) to the plastic ones, like a few countries already have, personally I think it's a good idea, but I've discovered a problem with the new notes, that being they're quite springy, unless you crease them, but they don't fold well and if you do crease them the crease doesn't come out easily. I'm aware that just using a contactless payment card makes this post irrelevant, but for those of us who still like to have cash in our pockets so we know what we've spent and how much we've got left read on. 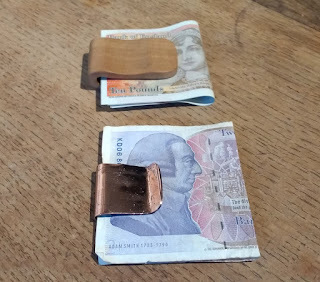 As I said the new notes are springy, on a couple of occasions I have dropped notes (and picked up very quickly) because they seem to spring out of my bag, I've also noticed that if they get a little damp they tend to stick together, that's something I've yet to solve, although keeping them dry helps. 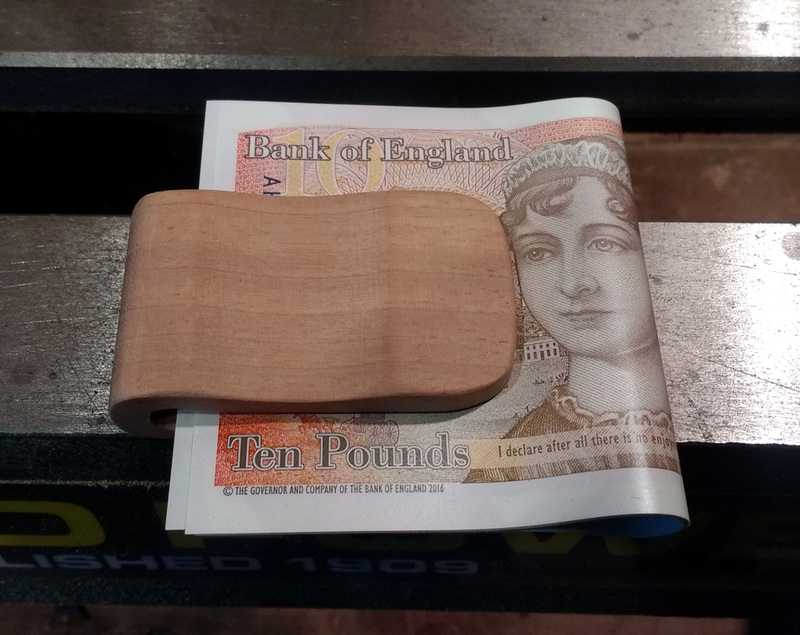 So to combat this I made a wooden money clip so I can keep the new notes (and old ones) in better order, I tend not to keep money in my wallet, I know this defeats the object of actually having a wallet, but hey ho. 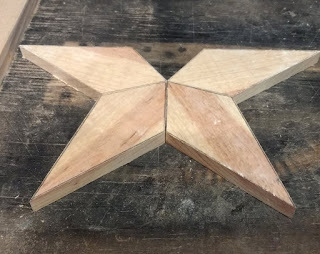 This is a simple make, you can easily do it with hand tools if you don't have a bandsaw and bench sander. I made mine from an offcut of walnut, but most any wood will do and who doesn't have scrap bits of wood in their shed/workshop ? 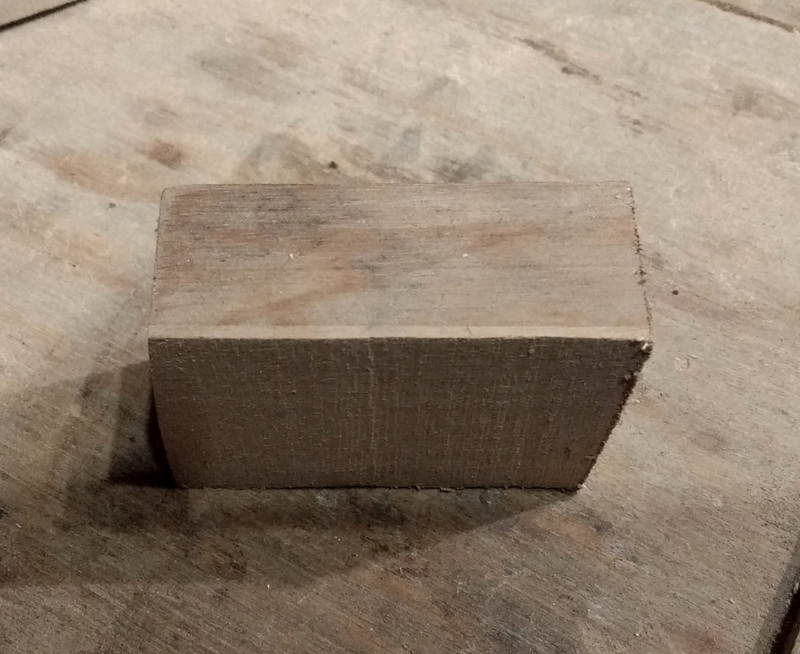 Not much to say, it's a block of wood. First I marked out the centre and where to drill a 7mm hole, make sure you go with the grain of the wood and not against it, otherwise it'll break very easily. Marked and ready for drilling and sawing. 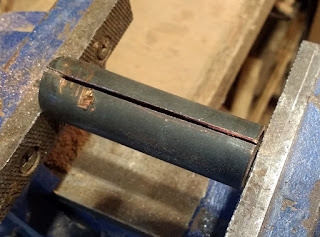 I used my bandsaw to cut down the centre line and then my post drill to drill out a hole, this just makes things a bit quicker, you could easily do this with a hand saw and a drill. On to sanding and shaping. I clamped the block into my vice and using a broken sanding belt I started to sand where I'd cut and drilled, this is where the notes will slide into, It's best to go easy here, if you take too much out you'll have to carry a load of notes around with you, so I did several tests for fit as I went a long. This step took hardly any time. 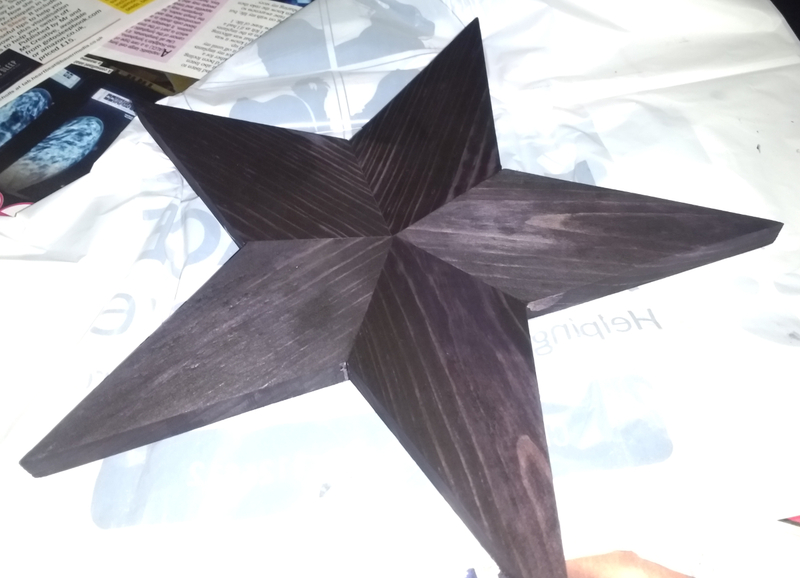 All done, now to shape it a bit. Once I was happy with the fit (it doesn't hold a load of notes, but enough for what I need) it was on to shaping it, this I did on my bench sander, but again an electric sander would do, just mind your fingers. 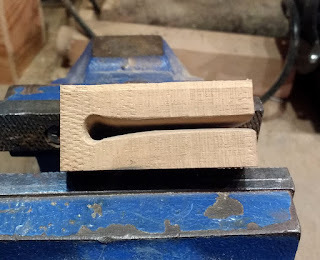 I decided to add a groove to the clip, this makes it easier to hold, I did this with a drum sander attached to my post drill but you can use drum sanders in a normal drill, you could even use a dremel type multitool as well. 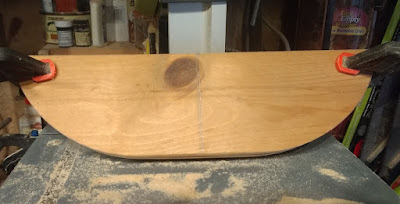 And after a little more shaping with my bench sander the only other thing I did was to give it a wax and that was it. Simple solution to a problem. 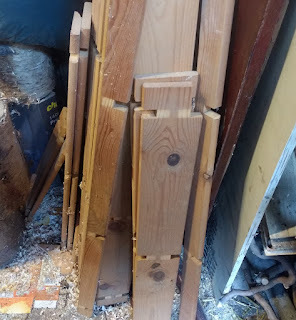 Don't like wood ? what about copper ? 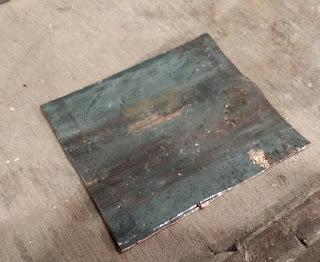 this is by no means a refined make, I did it very quickly and had I spent more time on preparing the metal it would look a lot more, well polished but I made it to mainly prove that anyone can make something like this easily, with just a few tools. Take one length of copper pipe (or you could use a strip of aluminium or steel) if you use pipe you'll need to cut it length ways. I used a hacksaw to cut it. Time to cut a strip off. 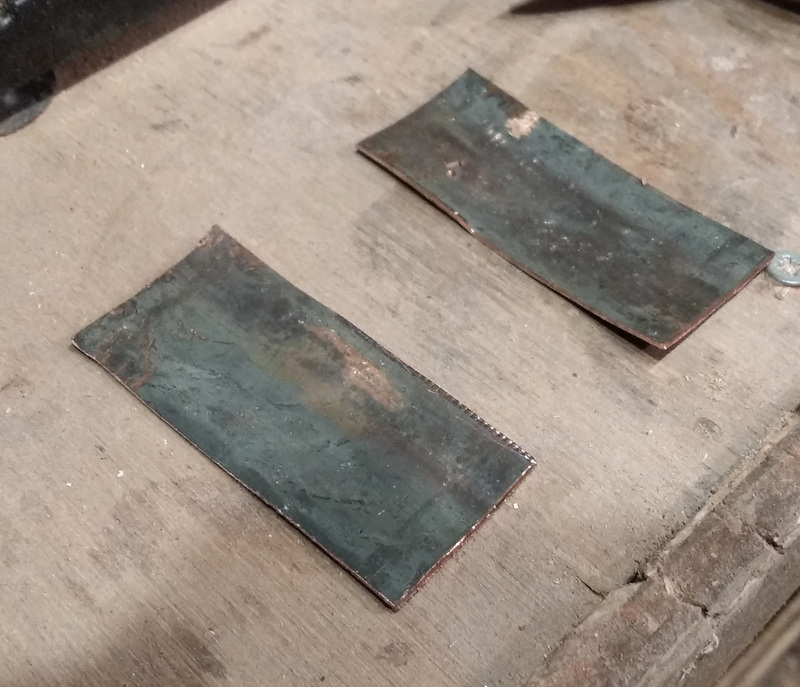 Using some tin snips (metal cutters) I cut the copper into two strips and then it was on to bending into a clip shape, or something near enough. Two for one, can't be bad. 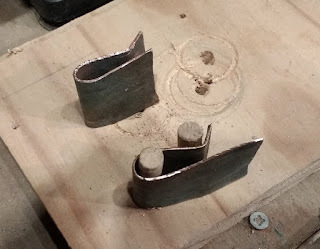 To bend the metal I made a very basic jig from a scrap bit of pine and a couple of dowels, I bent one end of the copper in my vice and then used the jig to do the rest. Once I was happy with the shape and the way it was bent I set about cleaning the metal, I sanded the inside of the clip so it didn't tear the notes and then polished the outside of the clip and shaped the ends a little, considering it took all of 20 minutes to make from start to finish it's not bad, and it works well. All done, basic but they work so I'm happy. And that's it really, the copper one would look a little less erm... rustic shall we say had I spent more time on it, but I quite like the way it turned out, I might make another and spend more time refining it just to see how it comes out, there's no reason you couldn't decorate the finished money clips, if you have some metal stamps you could personalise a metal one, if you're into pyrography you could burn a design onto a wooden one, so many possibilities and all from a scrap bit of wood and an old bit of copper tube.